You know that feeling when you finish a great book, and are ready to dive into something else, but you don't know what that something else is yet? If you ever get stuck looking for your next great read, try using NoveList. It is a fantastic tool that lets you browse or search for your next book. Not just for adults, NoveList also can help with book recommendations for kids and teens. What can you do with NoveList? 1. Browse lists of recommended reads. When you first get to the main page, you'll see an area at the left of the screen called Recommended Reads. You can browse lists of good fiction or non-fiction books, grouped by age and category. Interested in what the experts at NoveList think are good science fiction or romance reads? You'll find those types of lists there. 2. See similar books to current bestsellers. While you're on the hold list for Khaled Hosseini's latest novel, And the Mountains Echoed, why not peruse some of the other similar books that NoveList thinks you'd be interested in? 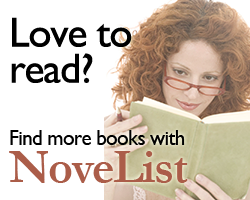 You'll find the bestseller read-alikes right in the center of the screen on NoveList. 3. Already devoured everything by one author? Find another author you'll enjoy. NoveList is great at giving you lists of authors that you might enjoy, based on authors you already like. Search for the author and you'll see a link to suggested read-alikes. What's great about the suggestions is that they tell you why you may enjoy those particular authors. You'll learn why this new author's style is similar or different from the one you've already read. These are just three of the ways that you can use NoveList to find good books. Next time you're at the library, why not ask a librarian about their favorite NoveList tricks? You'll learn more ways to explore this amazing resource.